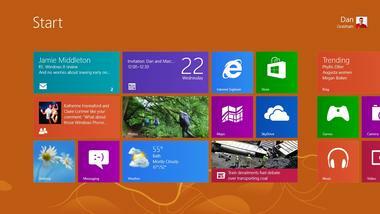 Windows 8 – finally Microsoft has woken up to Apple. I think this demonstrates my two audit mantras. First that fewer, better, will always work over many and worse. Second, that it is better when faced with seismic strategic challenges to think thoroughly and respond in an holistic, considered, and comprehensive way. Yes it is true that the challenges to Microsoft did not affect all of its business, this has given it time to respond. Apple’s reluctance to allow its closed software system to be open to corporate IT departments to tinker under the bonnet, has prevented its effective take up into the corporate world. Real world corporate computing is built not on a monolithic, centrally sourced software environment such as Apple wanted to create. Even if Apple could completely lock it down, no corporate that did not control or understand how it worked would be able to adopt it for its corporate IT. The Information Commissioner in the UK and internal auditors the world over would find the IT Department’s answer of ‘it’s Apple’s fault’ to be weak and indefensible if data breaches occurred. Thus corporate IT Departments would always need to be in charge of their systems and have some control over it. Second, and related, Microsoft’s Office platform still has no real rival, because the corporate world has not adopted Apple. Thus even as a Applephile I use Microsoft Office. So to my mantras. Microsoft’s response has been slow and thought through. The response even understands what Apple has sold, a personal IT ecosystem. The response is co-ordinated; a new tablet, laptop, phone and desktop, all within a single synchronous environment. The response is also learning marketing lessons from Apple. Make it look simple, beautiful, helpful. The tablet looks cool and seems to make the IPad seem, well, locked down. The single co-ordinated launch backed by a reported $1bn of marketing spend is also sensible. They are building a brand. With Apple so far ahead only a bold and significant step forward would make a difference. Thus instead of responding to the risk (or even issue) piecemeal, Microsoft has co-ordinated a single thought-through, better, response. This could in the future represent a big strategic mistake for Apple not to conquer the corporate IT environment while it could. Whilst Apple has learned the lessons of making computing work and linking all computing environments, most people work on computers at home and work. Most corporates are still struggling to cope with iCloud and the data control and protection nightmares it produces. Thus there will always be a corporate pull, and thus home pull, towards Microsoft. If Microsoft can allow corporate IT departments to manage the synchronicity of work and home computing it has a real chance of breaking Apple’s march. Apple still has youth computing stitched up, no kid on campus wants to be at university with a cumbersome Windows PC. With no need for a ‘work’ computer these kids can have this luxury. Once working for a government, bank or other employer, data protection, serious issues of data control and back up, kick in, and the carefree days of a cute Apple device go. Yet the latest Windows and its accompanying devices shows real promise to even be ‘cool’. Thus this should be an area we as internal auditors should keep on the radar. Data control is a big challenge, but connectivity and business effectiveness are needed too. Perhaps the real battleground will be which of Apple or Windows can crack the synchronous single virtual world, access on any device (PC, phone, tablet, laptop) yet allow proper segregation of work and home without compromising storage and control of data itself. We shall have to wait to see how this plays out. The current internal audit lesson from the story so far for me is that fewer, better and holistic and thought-through, is the right way to tackle strategic risk. What do you see in your clients’ corporate IT control environments?